The Protector Mole Cutter with one touch open system, which can be operated by one hand, and the Duct Cutter. The Mole Cutter can cut exactly at right angle and 45 degree. 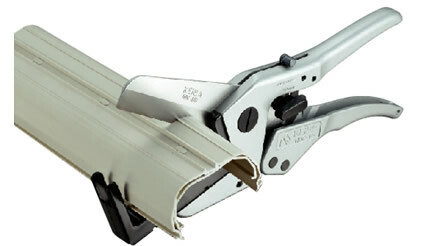 The Duct Cutter can cut two ducts on top of one another at the same time easily. They are designed for safety, which does not open unless the stopper is released.